Pete Rose played for the “the Big Red Machine” Cincinnati Reds from 1963 – 1978. Rose’s hard working style prompted Hall-of-Fame Yankee pitcher Whitey Ford to label him “Charlie Hustle,” a nickname that Rose would be known by for the rest of his career. Rose later joined the Philadelphia Phillies from 1979 – 1983, followed by the Montreal Expos in 1984. He was traded back to the Reds where on September 11, 1985, Rose broke Ty Cobb’s all-time hits record with his 4,192nd hit, earning hime the title of “Hit King”. PFP Sports & Celebrity Talent Agency is a top booking agent for motivational sports speakers and celebrities. 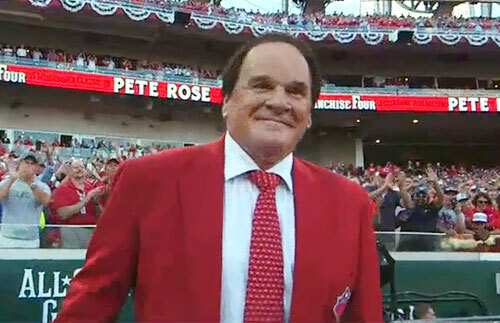 If you would like to book MLB legends like Pete Rose for a speaking engagement, personal appearance or special event, you can request Pete Rose agent and speaker information from PFP Sports & Celebrity Talent or call 800.966.1380.